Our graffiti removal services are popular with both commercial and domestic customers, as well as councils and local authorities. 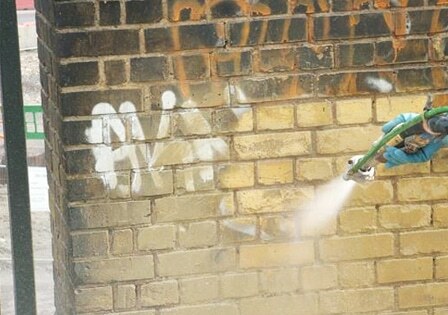 Whatever the type of surface, our high pressure cleaning can effortlessly remove graffiti from rough brickwork, concrete, plaster or even polished marble. Here at aquablast have an ongoing challenge on graffiti,in many urban areas. It is unsightly, and can be offensive. The problem can start with just one tag on a building then, just as one broken window leads to more, copycat tags start to follow and their rapid proliferation makes it increasingly difficult and costly to get things cleaned up. We use a wet blasting system and all machines are fitted with twin boilers so we can steam clean the graffiti off, with the use of no chemicals it is better for the environment.